All original material in this site is under copyright protection and is the intellectual property of the author. 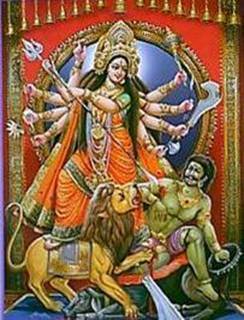 Durga is a warrior goddess and can be called on for protection and help in setting boundaries. She is the Hindu Goddess best known for fighting the buffalo demon Mahisha. The gods were unable to defeat Mahisha so they combined their shaktis1 and Durga was created. She is a beautiful goddess with ten arms2. Durga is one form of Devi who is the consort of Shiva. Other forms of Devi are Kali and Parvati. The Lion, rice bowl, fire, yellow-colored items3. She rides a lion into battle and in much of her artwork, specifically in scenes depicting her battling Mahisha. This ritual can be done in the fall, near Durga-Puja (the hindu festival to celebrate Durga). It can also be done in a waning or dark moon as a banishing ritual to banish danger. It can also be performed any time protection is needed or boundaries need to be created. Call in other warrior goddesses for the directions. If there is a boundary you need help creating or an area in your life that needs protection, focus on that. Leave the rice on the spoon on the altar for the day as a thank you offering. Light the yellow candle anytime you need safety. Kinsley, David. Hindu Goddesses -Visions of the divine feminine in the Hindu Religious Tradition. California: University of California Press, 1986. Telesco, Patricia. 365 Goddess – A daily guide to the magic and inspiration of the goddess. San Francisco: Harper, 1998. 4 This ritual was taken from 365 goddess, September 7. It has been expanded, but the basis of the ritual, and the chant is the same.